A driver was “lucky to be alive” after the lorry he was driving rolled on a country road yesterday. Firefighters cut the man free from the cab of the vehicle following the accident on the A950 New Pitsligo to Mintlaw road. He was rushed to Aberdeen Royal Infirmary for treatment with suspected broken bones. Firefighters who attended the scene had to smash the windscreen of the lorry to get access to the injured trucker. 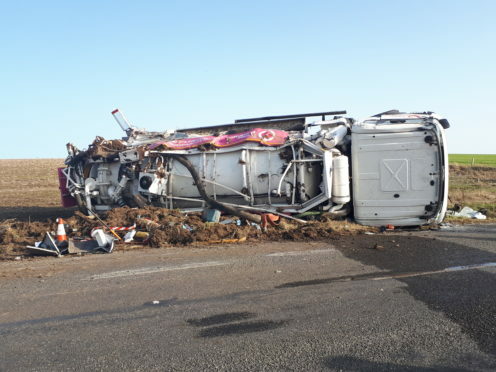 The driver of the drainage lorry was placed on a stretcher by paramedics and taken into a waiting ambulance before being transferred to hospital. The accident happened on the rural road shortly after 1pm. Community First Responder volunteers from Maud arrived at the scene to help the casualty before ambulance crews arrived. Three fire crews, two from Fraserburgh and one from Maud, were also called out to the scene of the collision. It is not yet clear what caused the accident yesterday, however, police have launched an investigation. A police officer at the scene said: “The driver is injured and inquiries are ongoing – if anyone witnessed what happened I would urge them to call 101. The 18 tonne vehicle, which was carrying eight tonnes of drain waste at the time, was left badly damaged on its side at the edge of the road. A police spokeswoman said: “About two miles outside of New Pitsligo just before the junction for the A981 a lorry overturned and the road was blocked. “The initial report came in at 1.15pm.